I have come across this book while browsing overflowing dusty shelves in the famous “Strand” bookshop in New York City. I was a few blocks away from New York University where Robert Boynton teaches journalism and is the Director for the Literary Reportage concentration. I had been interested in journalism for ages, since those snowy days spent reading John Reed’s autobiography in a Montreal café. I had started reading and collecting books on journalism from then on and as these books gradually piled up on my bookshelves, I developed a strong affection for them (the actual material objects that had travelled thousands of miles with me) and for their authors who made me realize how much I wanted to write and how hard I knew it to be. Good investigative journalism is as much about writing than it is about investigation. All the journalists interviewed in the book attest to that. Writing is what they do, day in and day out. Writing is the driving force, it is the motor and it is the fire. It is also what feeds their loneliness and fear. The writing process is at the heart of this book and it is what made me read it and read it again and tell all my friends about it. It is a book about methods, forms of inquiry, sense-making processes and writing approaches. The book is a collection of interviews with eminent journalists (the likes of Gay Talese, Calvin Trillin, Lawrence Wright, Ted Conover, Michael Lewis, Adrian Nicole LeBlanc, Jane Kramer, Eric Schlosser or Jon Krakauer- for a complete list, se the book’s Introduction) who, for the most part, favour book length investigations and long form journalism of the kind that is published in The New Yorker or The Atlantic. They have all (there are a total of 19 interviews in the book) published rich, in-depth pieces on subjects ranging from dysfunctional families or mountaineering to terrorism and America’s underground economy. Aside from the fascinating and broad-ranged topics addressed by these journalists, it is their writing process that is at the heart of the book. “The goal of this project was to find a way of talking about writing- as opposed to the idea of writing- that was at once demystifying and edifying; to make an often baffling process become more tangible and, perhaps, more manageable” (Preface, p. xxxiv). Beyond a focus on writing as a purely cerebral or intellectual process, the books looks at it as a social and material practice. Interviews with the journalists in the book are mainly about places, faces, body language, smells, feelings, desks, tape-recorders, hastily scribbled notebooks and often exhausted bodies. Reporters are fieldworkers just as we-academics- are but the focus here is more on the way the stories get shaped than how journalists get hold of them. Doing “journalistic work” or using a “journalistic style” has a strong negative connotation in academia. Worse, in the broader world, these words usually refer to a socially constructed collective understanding of journalism that sometimes dangerously verges on equating reporting with trashy, immoral, debasing tabloid journalism. This limiting (and basically false) understanding of what journalists do is still unfortunately too prevalent. Tom Wolfe’s “New Journalism” and Boynton’s “New New Journalism” contribute to set the record straight on a serious, rigorous literary practice that academics can learn a lot from. If our job as academics is ultimately to make theoretical contributions from data collected using solid methodological approaches, those of us who favour qualitative approaches (like narratives, ethnographies, grounded theory or practice theory for instance) have to admit that writing is the “glue” that makes everything sticks together. This reminds me of a quote by Henry Mintzberg on organizational culture that stated that if structure was the skeleton then culture was the “soul” of an organization. Maybe writing is the soul of our papers. In any case, writing is what matters here. It is, according to Ted Conover, one of the journalists interviewed in the book, what enables an experience to be told in all its complexity and richness, to “take life”, to shift from being the experience of a tourist to that of a traveler “The tourist experience is superficial and glancing. The traveler develops a deeper connection with her surroundings. She is more invested in them- the traveler stays longer, makes her own plans, chooses her own destination, and usually travels alone” (p.8). To this day, I haven’t found a better quote to convey what research means to me. Parts of this book are very useful and inspiring. Some research tips are insightful; like Jane Kramer’s advice to always take the perspective from the margins when you want to understand Power. Some interview techniques are particularly interesting. Veteran Washington reporter Richard Ben Cramer for example, suggests that if you are to interview people in their homes, then go for the kitchen “ If I find myself talking to someone in a living room I’ll say, “could you do me a favor? Could we do this at the kitchen table? Because it’s so much easier for me to take notes there”. I don’t actually write anything down, but the conversation is so much better in the kitchen”(p. 49). Interesting parts of the book tell us about writing routines: Jon Krakauer writes at least six to seven hundred words per day; Richard Ben Cramer does not write one word more than his one thousand daily self-imposed rule; Gay Talese wears a shirt and tie everyday and goes to what he calls his office to write for a few hours before hitting the gym; Jane Kramer cooks elaborate meals. Some writers prefer writing facing a wall (William Finnegan), others need to watch birds while they write (Laurence Wright); others write in coffee shops (Ron Rosenbaum); some like Adrian Nicole LeBlanc write first thing in the morning before they’re fully awakened. The “New New Journalism” is full of little gems that you wish (and hope) you can remember long after you’ve finished reading the book. It is one of the best methodology books I have come across to inspire students and makes them want to find their voice. Through the technicalities of writing, its idiosyncratic nature, its deeply constraining and ultimately immensely liberating power, something is going to take shape and reach other people in a very particular way. Our research can only benefit from paying more attention to rhythm, form, style, tone, character, story arc, or voice; all of which are discussed at length in this book. Our papers have an undeniably literary element. It is time to nurture the neglected aspect of our research. It is time to nurture the “soul” of our papers. Reading this book can definitely help. 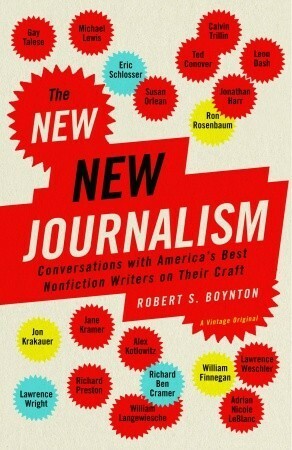 Boynton, R. S. (2005) The New New Journalism. Conversations with America’s Best Nonfiction Writers on Their Craft. New York: Vintage Books.